New today on Blu-ray: Don't miss the final installment of the pulse-pounding blockbuster franchise RESIDENT EVIL: THE FINAL CHAPTER, starring Milla Jovovich. Based on the highest grossing video game film franchise of all time, RESIDENT EVIL: THE FINAL CHAPTER returns to where the nightmare began - The Hive - in an epic battle that will ultimately determine the fate of mankind. 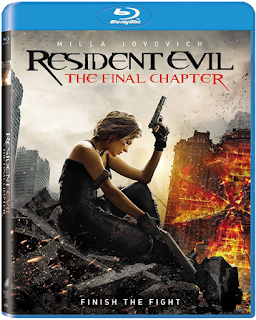 Get RESIDENT EVIL: THE FINAL CHAPTER now on Blu-ray, DVD & Digital. From Sony Pictures Home Entertainment. Rated R.